Videos of the performances Social Sculpture Foundation I, Regal Star Project (1983) and Social Sculpture Foundation II (1984), with the participation of Joseph Beuys. Waldo Bien, Social Sculpture II. Still from the video of the performance (1984). Courtesy of LIMA. Born 1949 in The Hague (NL). Student of Joseph Beuys at the Kunstakademie Düsseldorf between 1970-1976, Waldo Bien extensively engages with the concept of Social Sculpture in his work, including interdisciplinary research in anthropology and phenomenology. He is the Founding director of the Free International University World Art Collection, which aims to carry out social projects and activities in the field of art and science. The video of the 1983 performance Social Sculpture Foundation I, Regal Star Project (1983) Bien's choice of location is unusual. On a deserted ship he stages the morning ritual of shaving, which, due to the setting, becomes more than usually fraught with meaning. 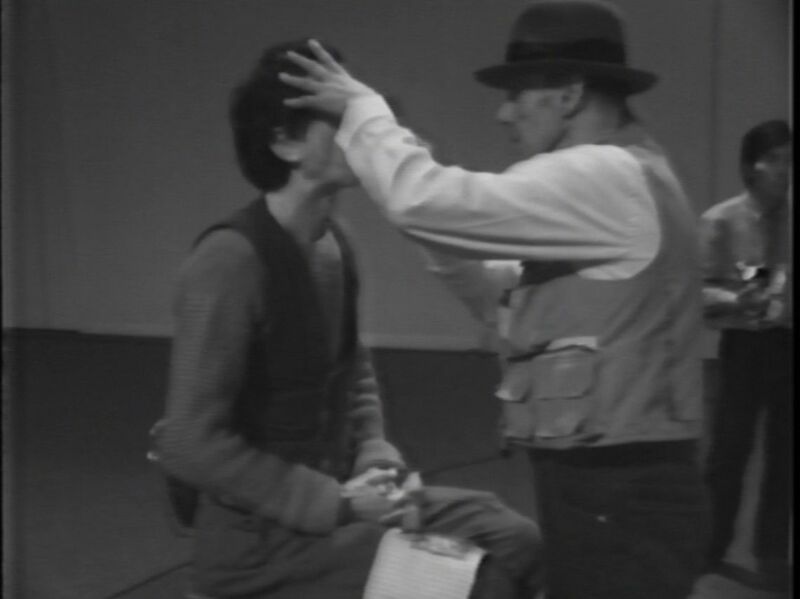 The 1984 video Social Sculpture Foundation II, a performance with the participation of Joseph Beuys. The video shows the performance in which Beuys – among other daily rituals - is shaving his former student Bien. This action takes up the basic concept of the Social Sculpture as a potential to transform society or the environment.